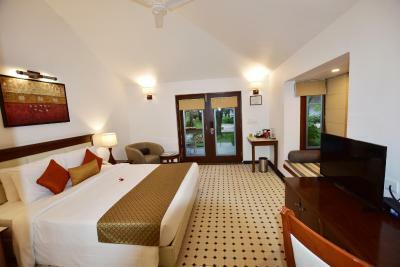 Lock in a great price for Novotel Goa Dona Sylvia Resort – rated 8.5 by recent guests! The breakfast was amazing and the staff too!! Special mention to Geeta who was literally a phone call away for all our requests. The rooms and facilities are amazing esp. compared to the other hotels in the area. The staff was Amazing! We had twin toddlers and they went above and beyond to be gracious and kind to them. Fantastic for families , the food buffet was excellent. Loved the pool and the beach. The service was exemplary. The room was very spacious. We liked the property very much. 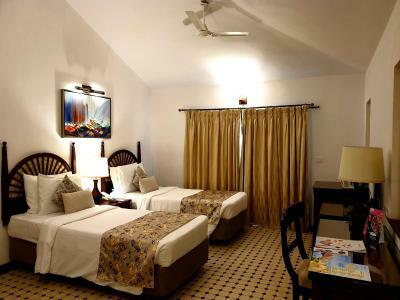 Especially our room (306) which had sea view. 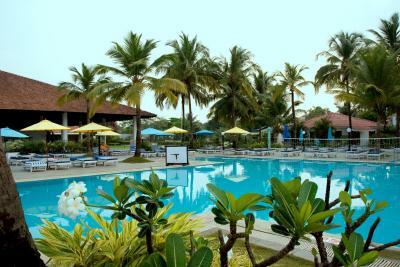 The property is huge, bang on beach, nicely landscaped with good variety of plants and colorful flowers all over. 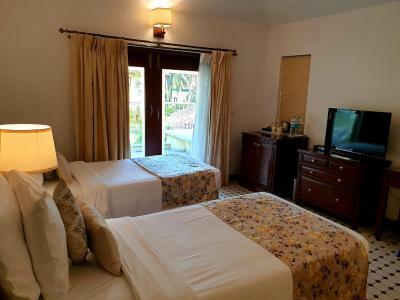 The cottages assure full privacy to guests. 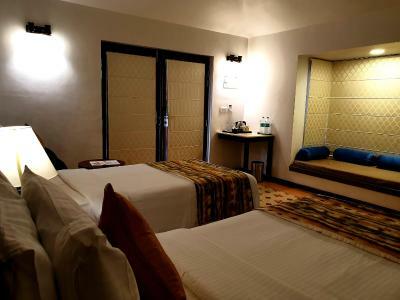 Rooms are tastefully appointed with in room amenities conforming to 5-star standards. 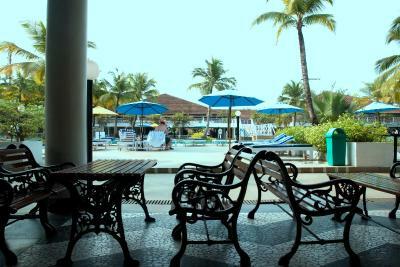 The swimming pool is huge with ample sunbeds laid around and manned by lifeguards. The hotel has it's own private beach access. 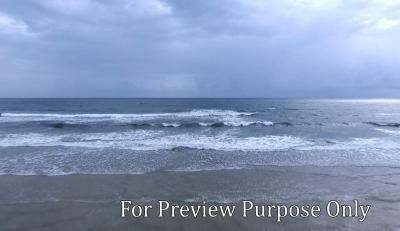 We were able to go to the beach whenever we felt like as it was just a stone's throw away from our room. Check-in and check-out was smooth. 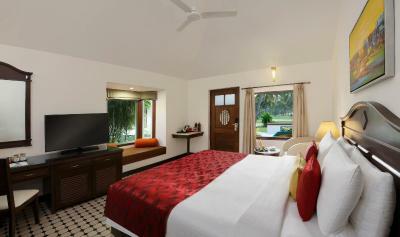 In room dining was good, we had ordered fresh fruit juice and farm fresh pizza which was awesome. Cleanliness was excellent. House keeping was prompt and efficient. 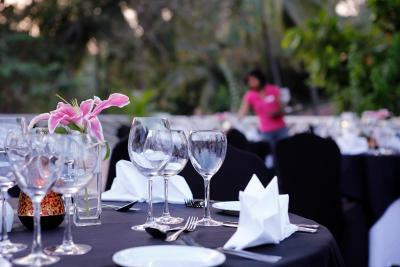 Staff is well mannered, friendly and helpful. Overall we enjoyed our stay and would surely return again. 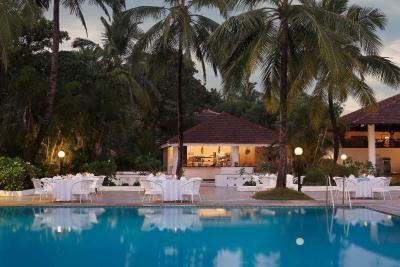 We would certainly recommend Novotel Goa Dona Sylvia Hotel to our friends, colleagues and relatives. Location was great. Food was good. Staff was courteous and helpful. Property was beautiful and clean. The private beach was superb. It was cleanly maintained and not much of a crowd as well. Apt place for a family getaway. 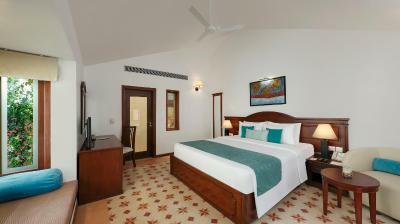 Novotel Goa Dona Sylvia Resort This rating is a reflection of how the property compares to the industry standard when it comes to price, facilities and services available. It's based on a self-evaluation by the property. Use this rating to help choose your stay! 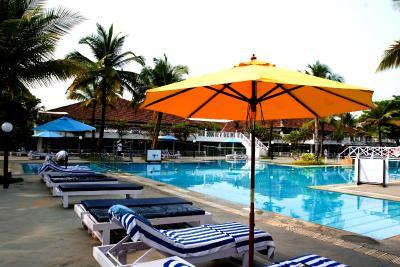 Set amid landscaped gardens, Dona Sylvia Beach Resort is a 5-minute walk from Cavelossim Beach. 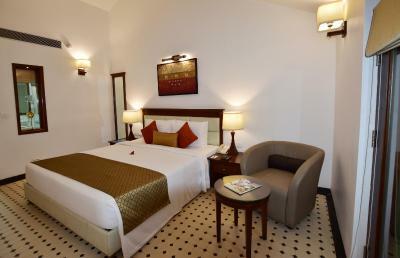 It features an outdoor pool, dining options and nonsmoking rooms with a private balcony. 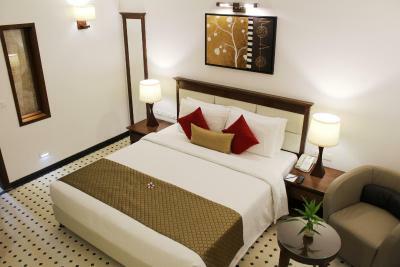 The air-conditioned rooms come with modern décor. 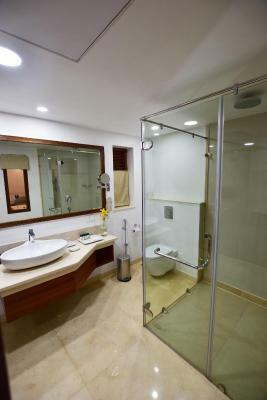 Each is equipped with a personal safe and private bathroom with hot shower facilities. 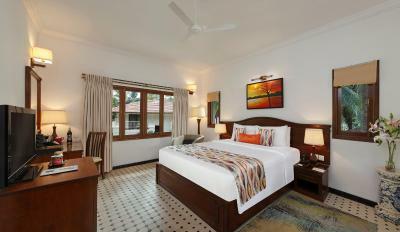 Dona Sylvia Beach Resort is 6.2 mi from Cabo De Rama Fort and 28 mi from Dabolim Airport. 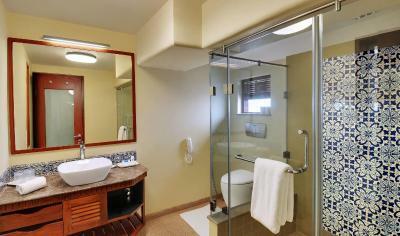 Guests can work out at the fitness center or play a game of tennis. 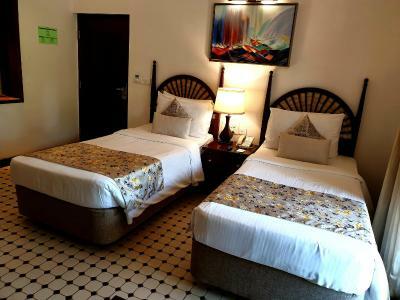 The resort also provides bicycle rental services and water sport facilities. 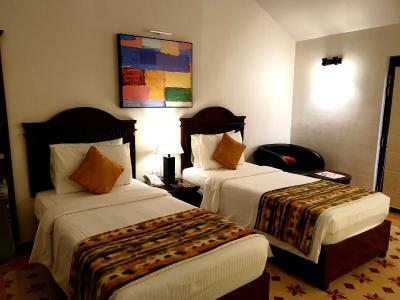 Dona Sylvia offers 24 hours room service for the convenience of the guests. 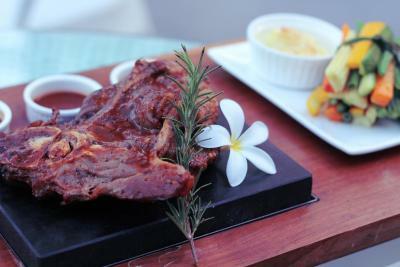 Seagull serves a buffet spread of international dishes, while grilled dishes can be enjoyed at Mama Mia (seasonal) in the evenings. Refreshing drinks can be enjoyed at Tia Maria. 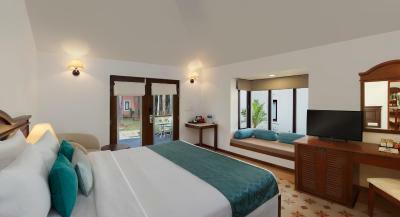 When would you like to stay at Novotel Goa Dona Sylvia Resort? 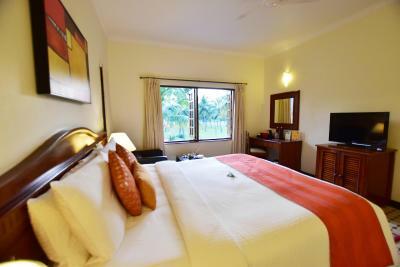 This double room features a balcony, seating area and tea/coffee maker. 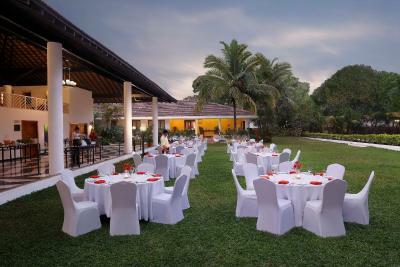 House Rules Novotel Goa Dona Sylvia Resort takes special requests – add in the next step! 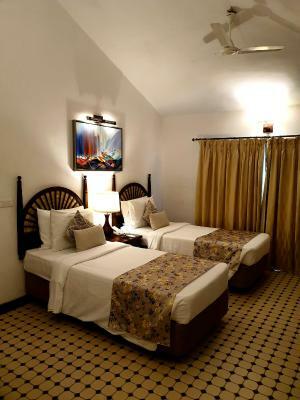 Any additional older children or adults are charged INR 4000 per night for extra beds. 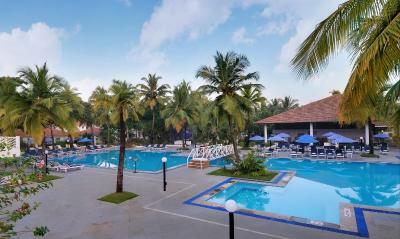 Novotel Goa Dona Sylvia Resort accepts these cards and reserves the right to temporarily hold an amount prior to arrival. 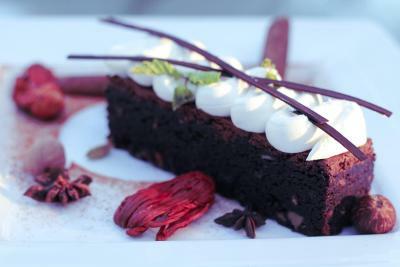 Please note that the property has a 31st December mandatory gala dinner - Room rate includes gala dinner for double occupancy. 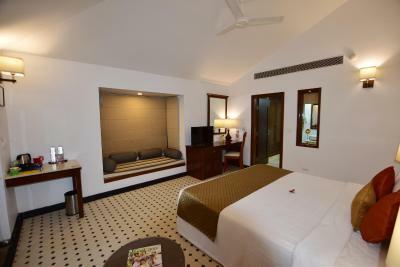 Extra adult - INR 6000 plus 18% which can be paid at the hotel directly. 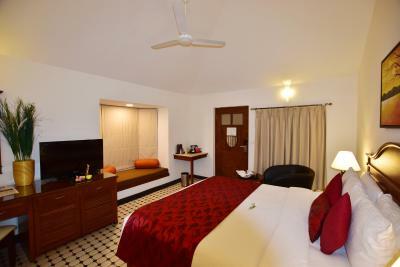 Awesome Property with all the facilities... all the staff are very supportive and helpful. Great property, clean and very convenient location. Very nice property away from crowded place. The only negative remarks are 2 1. 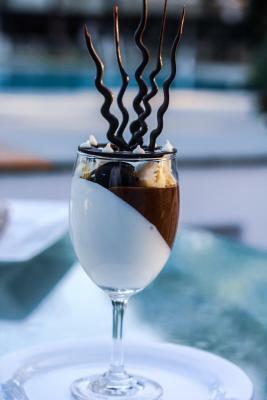 The heart of any hotel or Resort is Coffee Shop and breakfast time. During every day of my stay, the Coffee shop at breakfast time was Understaffed. I mean there was no one to offer water, one day there was no drinking water and we had to wait!!!. No one to pick up plates, That was quite surprising. 2. 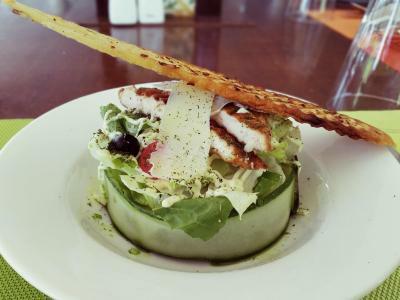 I always love to dine at staying place, this resort is very overpriced for food, although food is tasty and good quality but it's almost 30% overpriced than other comparitive restaurants. Food and room rate pricey. Location was great, beach very c.ose. Lots of choices for nearby restaurants. Breakfasts was excellent and staff very professional. Gardens and pool wonderful. It's a minor comment only but it would make walking to and from the beach much easier if instead of walking through sand the path was perhaps covered by duck boards. Again only a minor observation but the availabilty of a table tennis table and pool table would have been a bonus. 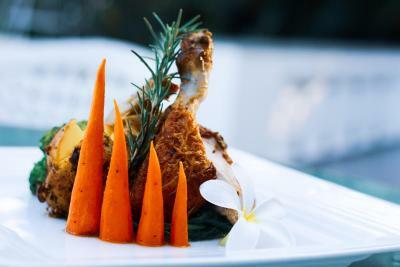 The hotel is perfectly situated to visit the excellent local restaurants. It's a fairly short walk to Cavelossim Beach which is vast and good for walking, swimming or just lazing in the sun. The beach restaurants provide good sun beds with matresses and sunshades which are clean and free, they just expect you to buy a drink or two or eat lunch which is very good. We chose Seaways managed by Khan and the food and service were both friendly and fantastic value. The beach sellers can be a problem but they will leave you alone if you say a firm no. There was virtually no mosquitoes or flies to bother you in March. 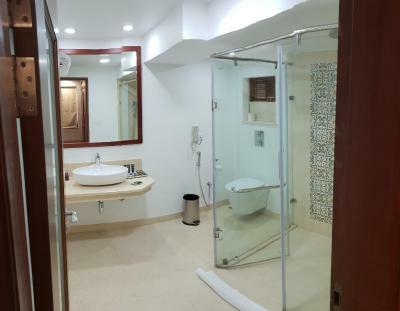 We rented a Boutique Villa King Room which is a semi detached bungalow, it was large inside with a lovely bed, seating area and big bathroom with a large walk in shower. 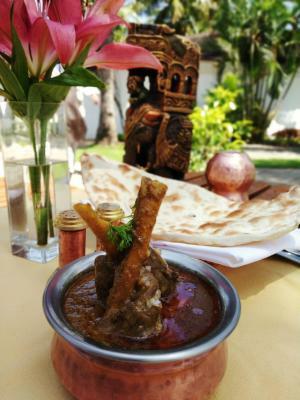 The breakfast is comprehensive with loads of Indian/Goan dishes but a bit limited in terms of Westyern cuisine but we found enough to satisfy us during our stay. All inclusive is just not necessary given the proximity of the local restaurants and bars and the very cheap cost of food and drink. We did the beach party from Mikes Restaurant for which there is no charge and they transport you to the venue where the music and food were good and still at the standard prices. 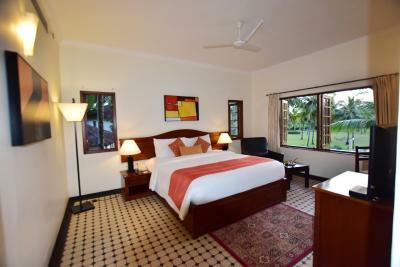 The hotel pool is large and clean and great for a dip after sunbathing on the beach.The grounds of the hotel extend to 20 acres and the gardens are well maintained and very pretty with numerous plants, trees and flowers. 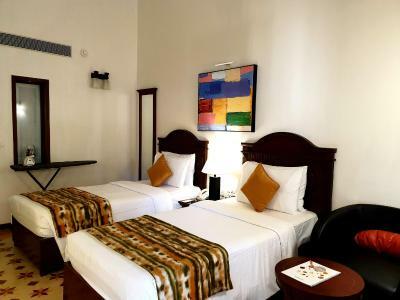 If you want to travel any distance during your stay or just to transfer to the airport and back the taxis are very reasonable although the driving is unbelievably scary. Our full spa experience - staff at the spa reception were not the friendliest and provided inaccurate information about the treatments. What the staff said was a Balinese Massage was more an Indian Ayurvedic Massage with excessive oil. 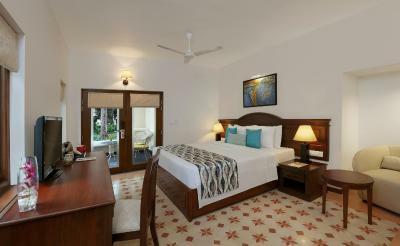 Colorful Portuguese villa style rooms enhance the holiday experience. 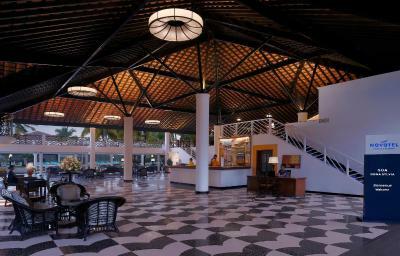 Great location (supermarket, restaurants, shopping, etc. just outside the resort). Nice swimming pool and direct beach access to a very nice, clean beach with shacks/restaurants, sunbeds, water sports, etc. Decent buffet breakfast; good variety. Breakfast- good spread but no flavor or taste quotient was missing. 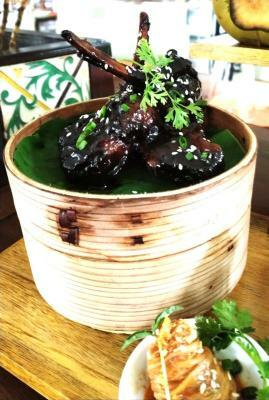 Also the room service dining food was just satisfactory so they need to up their taste factor or change the chef! :| And what's up with the taxi mafia and why does the hotel allow this ?!?!? Service is slow and staff get orders wrong. 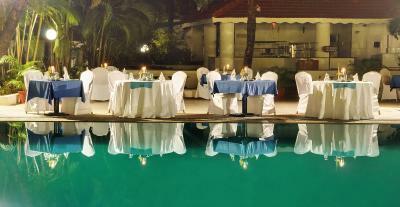 The service around the pool area is quite bad with only 1-2 waiters around. 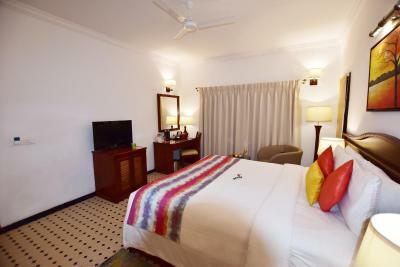 Great location, nice rooms and accessibility to the beach with a nice pool area.